IKEA's Symfonisk Sonos speakers to go on sale in August | What Hi-Fi? IKEA and Sonos have finally revealed their collaboration smart speakers. The Symfonisk range comprises a desktop lamp speaker and a more standard bookshelf speaker. They're reportedly the result of years of collaborative work between the two companies. You can control both speakers through the IKEA app on your smartphone and integrate them into a multi-room set-up. They're compatible with Sonos' existing speakers, too, which is a handy feature. 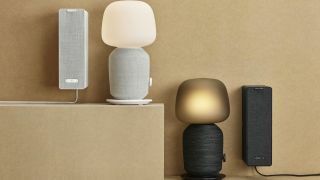 The Symfonisk table lamp with Wi-Fi speaker (to give it its full name) will cost £150/€179/$179, while the Symfonisk bookshelf with Wi-Fi speaker is £99/€99.95/$99. Both will ship in August. They're both cheaper than Sonos' own speakers (the Sonos One starts at £199). So it will be interesting to see how they sound. The lamp speaker has a dial to control its light function, though it only turns it off and on, it's not a dimmer switch. It doesn't come with a smart bulb, so if you want to control the light from your phone, you'll have to buy your own smart bulb. There are also buttons on the base unit for changing track. The bookshelf unit is the smallest speaker Sonos has ever made. It boasts Sonos' TruePlay technology, which reads the layout of a room and adjusts the speaker's output depending on its position within it. In terms of hard specs for both devices, there's not much to go on. Both feature two class D digital amplifiers, a tweeter and a woofer. The lamp speaker has a sealed enclosure, while the bookshelf has a ported enclosure. But that's about it in terms of specifics. Both feature some of the same chips as the Sonos One, but don't have built-in microphones, according to The Verge. The One also has touch-sensitive controls rather the physical buttons seen on the IKEA models. As well as working with each other and other Sonos speakers, they both have Apple's AirPlay 2 tech for playing music wirelessly from smartphone apps, or with voice commands using Apple's Siri personal assistant. The collaboration makes sense for both firms. IKEA gets Sonos' sound expertise, while Sonos can sell lower-priced speakers without devaluing its brand. The two firms have hinted that future instalments in the collaboration could include the Alexa smart assistant, while the IKEA app will soon let you control the speakers, smart lights and IKEA's own smart blinds too to create a whole smart house routine. Rest assured we're chasing down review units as we speak.